NeoGrowth, the pioneer in digital lending for SMEs in India, and Paisabazaar.com, India’s largest online marketplace for lending products, have partnered to provide swipe-machine-based or POSbased loans to small and medium scale enterprises. NeoGrowth and Paisabazaar.com have disbursed POS-based loans worth Rs 6 crore to merchants from 10 cities in over a couple of months. This includes Bangalore-based ‘Oye Restaurants’, which received a POS-based loan of Rs 35 lakh from NeoGrowth, within four days of application on Paisabazaar.com, making it the largest POS-based loan disbursal sourced through Paisabazaar. NeoGrowth's POS-based loans, available on the Paisabazaar platform, involve analytical underwriting on the basis of digital spends taking place through card swipe machines at the borrower's outlet, along with other alternate data. These loans also allow daily repayment facility, instead of monthly EMIs. The 7th Global Economic Summit, which concluded on 24th February 2018, was an ideal platform to assess the state of play with respect to Indian Micro, Small & Medium Enterprises (MSMEs) in the global value chain. The 3-day Summit included panel sessions, case presentations, exhibition, B2B meetings, felicitation of outstanding business organizations and knowledge workshops. “In India, MSME sector has recorded an annual growth of more than 10% over the past few years. It is crucial to rationalize and simplify taxes for MSMEs as they account for almost 99% of companies filing tax returns in India,” said Gen. (Dr.) V. K. Singh (Retd. ), Minister of State, Ministry of External Affairs, Government of India at the 7th Global Economic Summit on ‘Global Value Chains: Accelerating MSME Growth, Development and Sustainability’ . NeoGrowth was honoured with an award for Outstanding Financial Services. 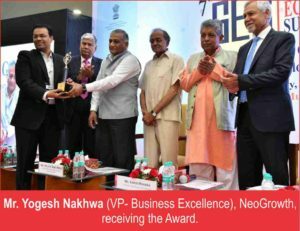 Mr. Yogesh Nakhwa, VP- Business Excellence & Operations, represented NeoGrowth for receiving the award. A key factor which made NeoGrowth stand out for this honour was the positive impact that its loans caused on the society. This Social Impact that NeoGrowth loans cause in terms of job creation, women empowerment and business expansion for SME’s was deeply appreciated at the GES summit. The Government of India’s initiatives for MSME’s, focusing on two key areas – enabling MSMEs to make more high-value products and ensuring they have timely and adequate access to credit and funds were the key highlights during the summit. NeoGrowth has been working actively since past 5 years towards addressing this major challenge of providing quick & easy access to credit to this under-served SME segment. Even today, 50% of SME retailers do not have access to formal funding and NeoGrowth, through its technology enabled processing is addressing this need by providing loans to the merchants against their future digital sales, thereby unlocking credit that is tailored to the merchants business requirement and helping the merchant grow his business. The 3-day Global Economic Summit received an overwhelming response from more than 100 business and government delegates from 30 countries and 280 delegates from India. The Summit was jointly organized by World Trade Centre Mumbai and All India Association of Industries(AIAI).